Both honey and garlic have natural antiseptic and healing properties and the combination of the two provides even more health benefits. The best way to combine the healing benefits of honey and garlic is to infuse garlic into raw honey. Honey is full of vitamin, minerals and enzymes. Just one small tablespoon of raw honey contains incredible amount of nutrients. The antioxidants present in raw honey are the real benefit for immune system. Honey is also an excellent medium for transmitting the benefits of garlic to the body. Soaking garlic cloves in honey will increase its immune boosting power and make it more palatable. Garlic has been a food and medicine for thousands of years. It is a powerful immune-booster. It has antimicrobial, antibacterial and antioxidant properties. Most recent research has shown that garlic’s antibiotic qualities comes from the sulfur compound called allicin. Cooking garlic destroys the allicin rendering it negligible for healing. Thus, cooked garlic has virtually no antibiotic value. 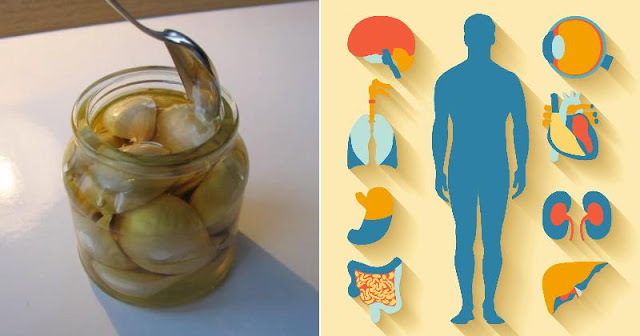 When infused in honey, raw garlic becomes far more palatable and also retains its antibiotic properties. Garlic infused honey contains many properties such as antioxidant, antibacterial, antifungal, antiparasitic, and anti-cancer properties. It can provide your body with all the vital nutrients without affecting level of blood sugar. It can help to prevent the plaque build-up in arteries which can create clots and cause cardiovascular disease. It help metabolize cholesterol and fatty acids in the body, which in turn makes it easier for you to maintain a healthy weight. Honey infused garlic remedy will boost the immune system and help ward off sore throats, colds or the flu. Put the minced garlic in the bottom of a 1/2 pint mason jar. Fill the remaining space in the mason jar with honey. Place the jar in a window seal, preferably facing south. After one month the garlic will have infused completely into the honey and will be ready to use. Store the jar in your fridge to keep it fresh.